*As I watched the sun rising in the east this morning on my walk, it looked a little hazy from the fires burning in the area. But it never got really bad, so not sure where that smoke is coming from. *It was a treat to talk to April M Lee this morning from Italy. It was wonderful getting caught up, since we hadn’t talked since she was here visiting last month. What a great way to start my day!! *A bit later, Paul and I hopped in the car and headed toward Montana to pick up our friend Brandon Church. He works in Superior, Montana as a Dispatcher for Mineral County. He was off today, and so was I, so we made plans to go to Missoula and spend the day together. Before we left Superior we got a tour of the Sheriff’s office. *Then it was off to Missoula. We ate lunch at the Iron Horse Bar & Grill. Paul and I had made a trip to Missoula over 10 years ago and ate there, because they were famous for their sweet potato fries. Now sweet potato fries are more common, but they still serve them at this place. We had a great visit over a delicious lunch. *After we ate lunch we headed to the river, and went to Caras Park. 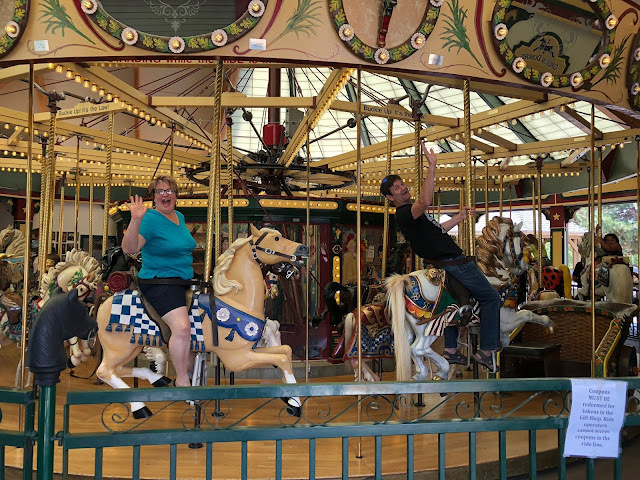 There is a carousel in the park, and Paul and I decided we needed to take a carousel ride. You have an opportunity to catch rings as you went around, and Paul ended up catching the brass ring, which means he won a free ride. He passed the free ride off to a gentleman who was there with a group of young children, so they could all get an extra ride. *We walked along the river, and decided a coffee drink sounded good. We found a coffee place downtown called Zootown Brew. It was a great place, and the coffee was outstanding. Brandon enjoyed being in downtown Missoula, because he had been to Missoula several times before, but only to one part of the city, and he enjoyed being downtown. *It was a fun day spending it with Brandon, and we enjoyed talking with him about his job, his future, and what lies ahead. And we enjoyed being in Missoula, and hope to return again soon. *After we dropped Brandon off in Superior, we headed home. I made a tossed green salad to take to Christy and Everett’s house for dinner. Molly’s birthday week continued with her getting a birthday crown from her Aunt Debbie, and a present from us. Her present had a theme. For the last couple of months, Molly has been trying to convince me how cute bats are, and that I should love them. Well, that is not going to happen, but I did pass on some “bat love” to Molly this hear with bat-themed birthday gifts, including a mask, pajamas, and stone carved bat, and a little good luck bat. It was a nice evening, continuing visiting with Lura and Lyle on a lovely Kellogg evening in the backyard. It was even a productive evening, with me bringing my knitting project over, and Debbie helping me get going on it again! !